I spent last weekend in Whistler at Cornucopia, a 10-day festival that celebrates all-things-food-and-drink in the mountain town known for its bacchanalian vibe come ski season. I had heard stories of great Cornucopia parties involving vodka shots in an ice room and seminars featuring 10 whiskey samples, and was eager to see if the festival lived up to the hype. I wasn’t disappointed. 1. Cocktails and dinner at Alta Bistro. Yes, please! I tried the cocktail special, a Strega Sour. Strega is an Italian liqueur with 70 herbal ingredients including saffron, fennel and mint (as I’ve come to learn, the Italians can make booze out of pretty much anything). Alta mixed the Strega with gin, lemon, honey syrup and an egg white to make a light and well-balanced sour with just a hint of liquorice (from the fennel). Everyone loved it. 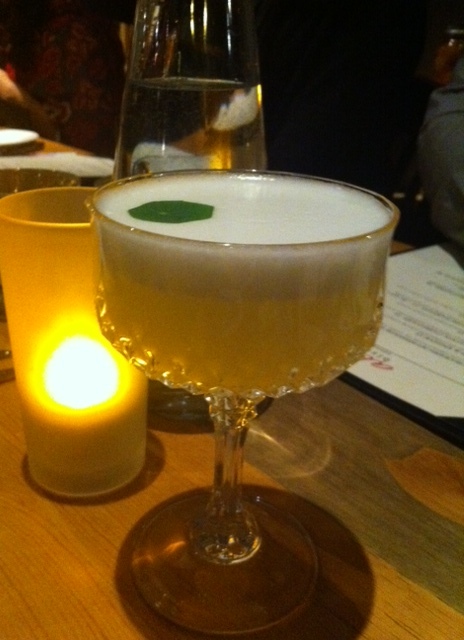 I loved this Strega Sour from Alta Bistro in Whistler. Method: Combine ingredients in a cocktail shaker and dry shake. Add ice and shake again. Fine strain into a coupe glass and garnish with a nasturtium leaf (if in season). 2. Belvedere Ice Room at Bearfoot Bistro. This is just what you need after cocktails and wine at dinner. 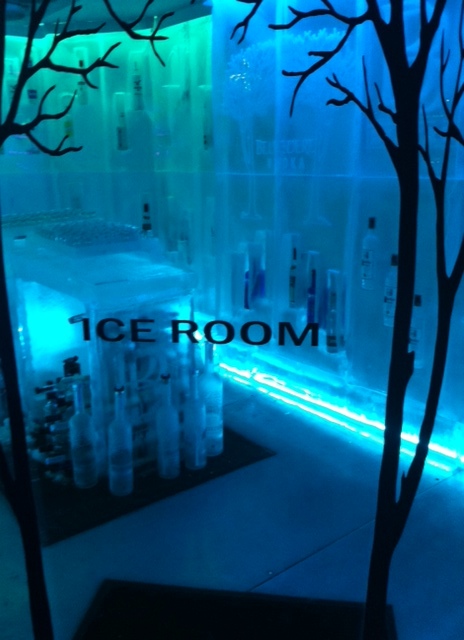 In the corner of the bar is a Belvedere-sponsored freezer room with walls of ice into which are carved niches that house over 40 bottles of different brands of premium vodka. To go inside the freezing space (it’s kept chilled at -25C) for a private vodka tasting you don a Canada Goose jacket (they’re rated for something like -100C, so you’re actually kind of hot), and send up a prayer that you don’t pass out after four vodka shots in five minutes (and get left inside the freezer overnight). The theory behind the room is that the cold tamps down the alcohol’s heat so you can actually taste the vodka flavours. Like kids in a dangerous candy shop, we tried regular, cherry, grape and salted caramel. If you like vodka, this is the room for you. 3. And then there was the bobsled. Bearfoot Bistro’s owner, Andre Saint-Jacques, keeps a bobsled suspended from the ceiling in the restaurant’s wine cellar. Naturally, we found ourselves wandering about down there after four shots of vodka. We asked Andre if we could get into the bobsled and the next thing we knew, he was lowering it down using some kind of hydraulic system. We piled in for a very strange photo op. 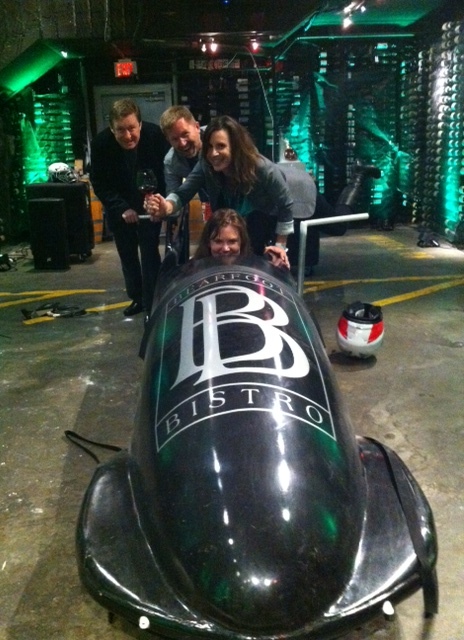 The Bearfoot Bistro bobsled. That’s owner Andre Saint-Jacques at the back left. Ah Whistler, the party carries on no matter the season! And, if you love skiing, you’re in luck — Whistler Blackcomb opens for the 2014-15 ski season November 22. “Sours month” continues here where I try one of my all-time favourites, the whiskey sour, but using a new 100% rye whiskey from Canadian Club. 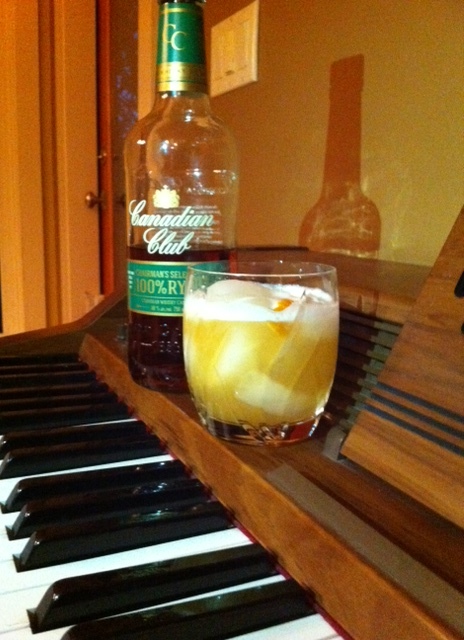 This robust and rye-forward (read: spicy) Canadian Club Chairman’s Select is made from single grain rye. This is a departure from traditional whiskies, which typically have mash bills weighted toward wheat or corn. Chairman’s Select is distilled in Calgary at Alberta Distillers, aged in bourbon barrels and bottled in Walkerville, Ontario. It’s nice on its own but I prefer whiskey in a cocktail, such as the CC 100% Rye Whiskey Sour. It’s delightful, but suffers from the same problem as all sours: you will drink it too quickly and want another one right away. Method: Shake all ingredients vigorously without ice for 10 seconds. Add cracked (or cubed) ice and re-shake for another 10 seconds minimum. Serve straight up with no ice into a chilled cocktail glass (champagne or cocktail coupe) with fine strainer (e.g. tea strainer). A change in the weather calls for a change in cocktails, from tall to short, and from light to dark. 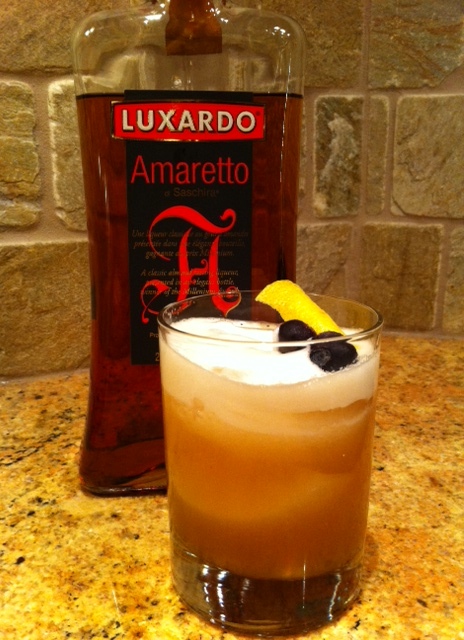 My gig as a judge at the Luxardo Maraschino cocktail competition earlier this week at Raw Bar by Duncan Ly provided me with the inspiration for just such a drink: an Amaretto Sour. 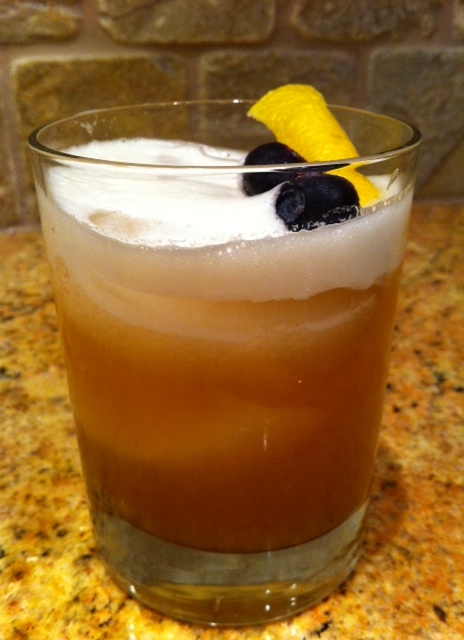 Smooth, sweet and Amaretto Sour. As I’ve mentioned ad nauseum, I really love sours, so I was excited to see that all of Luxardo’s liqueurs were in play for the competition, including amaretto. Some say amaretto is so 1980s, but I say, wait a minute! It really helps to mix it with something beyond Coke; for example, bourbon, lemon juice and an egg white. Isn’t that a cool bottle? In fact, One of my favourite cocktails from the competition was a twist on a sour, using amaretto and maraschino liqueur, by Tony Migliarese from Cilantro. I didn’t manage to get his recipe, but I did come home with a bottle of amaretto. Then, I turned to The Google and found this great recipe online. Method: Combine ingredients in a cocktail shaker and dry shake. Add ice and shake again to chill. Strain into an old fashioned glass filled with ice. Garnish with a lemon twist and brandied cherries. — Recipe comes courtesy of Portland mixologist Jeffrey Morgenthaler, as contributed to Liquor.com.